I'm trying to understand how free-to-play games like Candy Crush Saga use existing knowledge of the human brain to keep people engaged and how they convince players to pay money for in-game goods. Some of their game mechanics remind me of the Skinner box. Interestingly, some sources claim that a very small percentage of players contribute 50% of their revenue. I'm assuming this is because not everyone is as susceptible to their monetization tricks. Some addicted players dump all their money into the game, which puts pressure on game developers to protect vulnerable customers from themselves. Research on big spenders in free-to-play games seems to be scarce, but are there any parallels with existing research (e.g. on gambling) that explain why many people will never spend a dime on these games while others are struggling not to spend their life savings on it? For example, is there a significant difference in how individuals respond to conditioning? Summary: From the few papers I've looked at, microtransaction-based games tend to work as suspected/designed. That is, games which rely on frustration to get the player to spend money (like Candy Crush) tend to obtain money from players with low tolerance for frustration; games which are more related to gambling (like "social casino" games) tend to get money from players who score high on gambling-problem scales and so forth. There are probably not enough high spenders in such games to reflect their behavior in the (unweighted) average player. There's one cluster-analysis paper suggesting that the motivations of the high-spenders (and thus possibly other parts of their psychological profile) are different than those of the average spender. But I think the research on that is too limited to draw firm conclusions on this aspect. Our study reveals that the amount players spend on in-app purchases is correlated with lower levels of self-control. On the other hand, purchases and self-control levels were not significantly correlated with the amount of time people play, game addiction, or problem video game playing. I'm trying really hard not to spend money on games. I did it a few times after being stuck for weeks because I was frustrated but I'm trying not to do it again. I am feeling really frustrated because I am having trouble getting past this level. I know that if I buy the fish boosters, then I would have an easier time of getting past this level. I am seriously contemplating hitting the buy now option on my ipad to purchase the boosters. I get frustrated with myself and disgusted at the game turn it off, and then go to play farm hero saga instead, which is similar to candy crush but it is a lot less difficult to spend money on it because it is easier to play. There's a more recent (2016) paper "Who Spends Money to Play for Free? Identifying Who Makes Micro-transactions on Social Casino Games (and Why)." limtited alas to "social casino" games like Slotomania. Results showed that social casino gamers who engaged in micro-transactions reported significantly higher levels of impulsivity, reward sensitivity and problem gambling severity, but not competitiveness. In terms of motivation to make micro-transactions, desire to extend play was endorsed most frequently, followed by a desire to access additional features, chasing lost credits, and to speed up play. Lastly, among participants who made micro-transactions, reward sensitivity predicted making micro-transactions to chase lost credits. 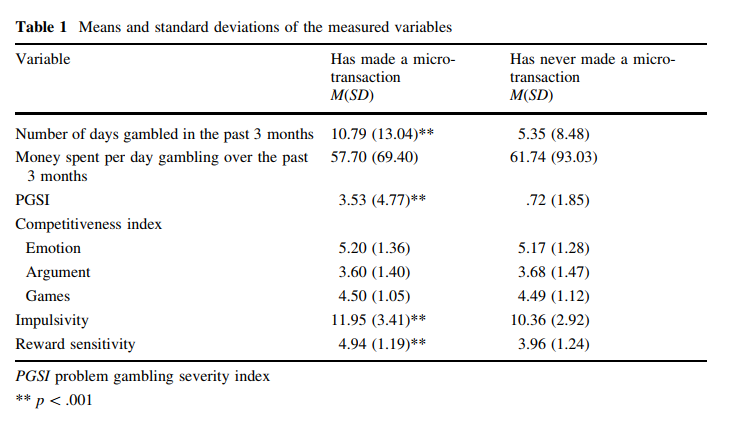 These results suggest the personality make-up of social casino gamers is important to understand who is likely to make micro-transactions as well as their motivation to do so-information that could prove useful for regulation of the industry. The results in this study confirm gambling-like addiction behavior as predictor for spending. The results may not fully generalized to other types of microtransaction games (e.g. where players more obviously compete with each other), but some seem consistent with the designer's intention in this particular game. I had never heard of "buying back your virtual credits" before, but apparently people spend money on that too. Perhaps a clever (or--depending on your point of view--unscrupulous) way to tap into loss aversion. Or maybe just a way of extending play in this type of game. The authors were quite reserved in their abstract; the breakdown of motives for various microtransaction incentives was close to statistical significance in quite a few other cases, e.g. impulsivity predicting the need to speed up the game had p=0.07; perhaps a better powered study would find some of these significant as well. 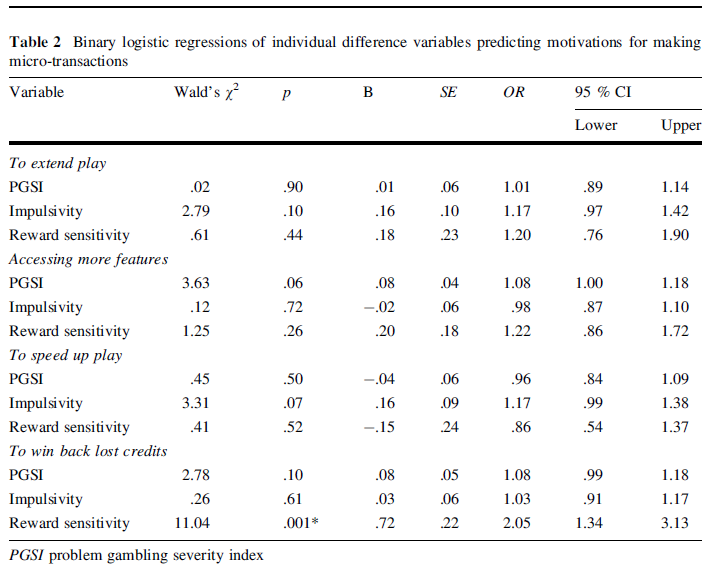 Reward sensitivity was measured using two face valid items anchored at 1 (strongly disagree) and 7 (strongly agree), ‘‘I play social casino games in order to win large sums of virtual credits’’ and ‘‘I don’t find social casino games to be rewarding [reverse coded].’’ Higher scores indicated greater sensitivity to rewards. A cluster analysis revealed distinct subgroups of paying players; these included more frequent moderate spenders who made purchases to avoid waiting for credits and to give gifts to friends as well as less frequent high spenders who made purchases to increase the entertainment value of the game. Of note is that there was no statistical difference in income or education between these groups. But these groups were still a substantial proportion of the sample; total sample was 521; of these 261 had ever made a purchase and the two aforementioned clusters had 67 (moderate but frequent) and 52 (high but infrequent) spenders. I think neither of these clusters captured the actual "whales" who are probably an even smaller group. Whales, defined as the top 10% of an app's spenders, account for 70% of the app's revenue from in-app purchases and for 59% of its total revenue (which additionally includes advertising). Whales "make approximately 7.4 in-app purchases per month, for a median average revenue per paying user (ARPPU) of $335." The rest of paying players make 1.75 in-app purchases per month, and have a median ARPPU of $17.94. But in contrast to this substantial monetary difference, the time spent in game is not that different: a median of 33 days compared to 40 days for whales. Ad-tapping customers had an ARPPU of only $3.38. 91% of users were non-spending. It's also interesting that spenders aren't that impulsive with their first purchase; the (average or median?) "time for spenders to make their first in-app payment is 16.3 days". This was based on Tapjoy’s "Personalized Monetization Platform", so it's presumably aggregate across multiple types of games. The reason why I detailed these is that the clusters from the previously mentioned academic study don't quite mesh with this industry-reported data. So I suspect there may be substantial variability depending on the game, how you cluster the data etc. The economic concept of marginalism comes to mind. Actors will spend money to buy virtual goods if the marginal cost (price) is lower than the marginal (subjective) utility of the virtual good. If you have lots of money it's easier to spend $10 on extra lives. This explains some of it. Most of the purchases are small, so the individual cost/utility analysis is biased, it's "just" $10. Over time it might become a problem. It's a lot like any other kind of addiction, and I think (baseless speculation) that the "big whales" are more likely to be predisposed for addictions than the general population. The utility, positive affect generated by a feeling of progress and accomplishment, becomes harder to maintain and creates a "need" to keep playing. And when the individual transaction costs are so low it's that much harder to resist. Edit: I've found some sources that might answer your question better. This paper discusses how game designers might think about it. Not peer-reviewed. From a different behavioural economics perspective. Some other papers on the topic. Note: Most of these discuss microtransactions and virtual goods. Candy crush is mostly lives, leading to different motivations than games like Team Fortress 2 with cosmetics like hats and skins (and keys). At least in part, the games include elements that make children more susceptible to buying in-app-purchases. Though this tactic may have been somewhat attenuated. virtual goods and whether they have a positive attitude towards using real money in virtual environments. Moreover, people seem to purchase virtual goods in order to give a favorable image of themselves. Furthermore, interestingly the enjoyment of using the core service where the virtual goods are sold in does not predict virtual good purchases while it is thought as one of the main reasons for using the service. These results could be in line with past literature that suggests that game operators attempt to increase demand for virtual goods by intentionally inconveniencing players by limiting some aspects of the game or making the game more burdensome to play. Therefore, enjoyment may have a double role in explaining purchases; enjoyment of the game is needed for retaining players and thus increasing the likelihood of purchases but on the other hand, negative enjoyment is needed for the player to feel the need to purchase more. Not the answer you're looking for? Browse other questions tagged motivation conditioning hci economics or ask your own question. Why do people donate money to others engaging in activities for charity? Why do some people only work well under pressure? Why do many people not use tabbed navigation (e.g. in an internet browser)? Why is it that some (yet not all) people may struggle to retain information unrelated to what they are interested in? Why do some people refuse to wear their seat belt while being aware of the risks?